The 'SLA' module allows you to define and manage your promises to your customers. Each agreement you create can specify how long a ticket is allowed to go without a response, how long before it must be resolved, which tech should start with the ticket, and who the ticket should be escalated to if these promises are broken. 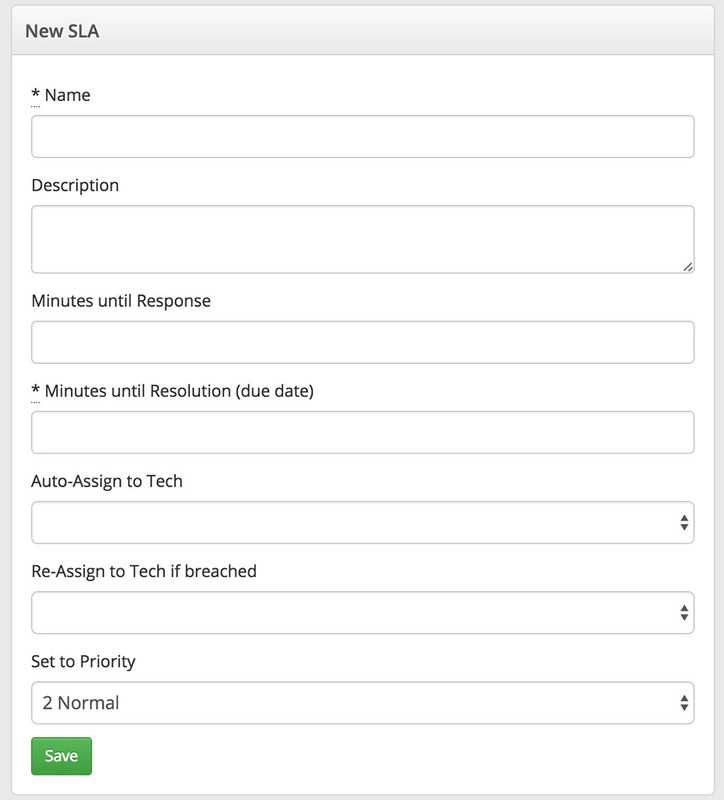 Notifications about SLA breaches can be configured in the Notification Center. A Service Level Agreement does not directly interact with the billing or invoicing system. We will not automatically apply a discount for your customers if the agreement is breached. Service Level Agreements are specified in minutes, not hours or days. If you want to specify a longer time period (more than a few days), those should still be handled manually for now--but post in the feedback forum so we know how many people would like that! SLAs may be assigned to contracts, to apply to all work for a customer, or to individual tickets. Breach of SLA (not providing an initial response in time or not resolving a ticket in time) can trigger notifications, configurable in the Notification Center.